By Scott Gilfoid: Michael Katsidis (28-4 23 KO’s) will be facing one of the lightest hitting fighters that he’s been up against in years when he takes on former WBO super featherweight champion Ricky Burns (32-2, 9 KOs) this Saturday night at the Wembley Arena in Wembley, London. On the line for the fight will be the interim WBO lightweight title. The current champion is Juan Manuel Marquez, who is way better than either Katsidis or Burns. It’s doubtful that Marquez will want to bother facing the winner of the Katsidis-Burns fight because he already badly beat Katsidis. There’s no gain for Marquez to beat him again. Katsidis, 31, is used to taking on fighters with excellent power or great skills like Juan Manuel Marquez and Robert Guerrero, both of which he lost to. But in facing Burns, Katsidis will be facing a guy with not much power to speak of and someone who really hasn’t done much to show that he deserved to hold down his former WBO belt. During his brief period as the World Boxing Organization champion, Burns only fought one good fighter in Roman Martinez, and struggled badly to get a 12 round decision win while fighting at home in Scotland. Martinez had problems making the weight on that night and seemed to be weight drained. After winning the fight, Burns fought mediocre opposition in his three title defenses ending with a farce against Nicky Cook last July. For those who don’t remember, Cook had fought only once in the past two years going into that fight and his back immediately ceased up seconds into the bout. With that win, Burns was finally supposed to defend his title against an excellent challenger in unbeaten Adrien Broner. However, instead of defending his title against Broner, Burns quickly vacated and moved up in weight. Burns would have likely been badly beaten by Broner had he stayed at super featherweight and taken that fight. Moving up in weight will likely be a bad mistake for Burns because his lack of punching power will be even more pronounced at this weight than it was at super featherweight. Katsidis is a big puncher and so much better than the guys that Burns has been spoon fed his entire career that it’s not even funny. 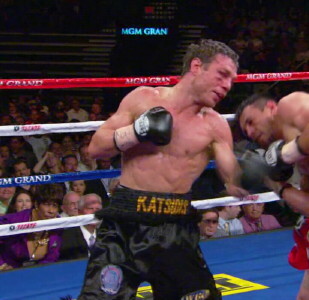 With nothing to hold Katsidis back, he’s going to be all over the feather-fisted Burns from the moment the fight starts and it’s going to be hard to see this fight going past the 5th. Burns is a brawler but without the brawler’s power. He’s gotten away with this style because of the weak opposition he’s faced his entire career. On Saturday night, Burns will be facing a real brawler in Katsidis, one equipped with the power and the speed that brawlers are required to have to be a champion. I see this fight as massacre with Katsidis making Burns look like a second tier amateur.